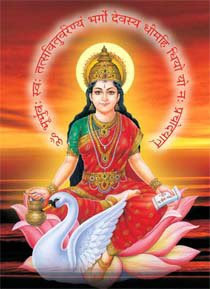 Gayatri Jayanti celebrates the manifestation of Goddess Gayatri, who is worshipped as Veda Mata (The Mother of Vedas). In 2019, the date of Gayatri Jayanti is June 13. Scholars also indicate that Sage Vishwamitra first uttered the Gayatri Mantra on the Jyeshta Shukla Ekadasi day. And this day is observed as Gayatri Jayanti day. Goddess Gayatri is also referred as Adi Shakti by Gayatri Mata worshippers. It is believed that Goddess Gayatri made her appearance on the 11th day of the Shukla Paksha (waxing phase of moon) of Jyeshta month. Symbolically, she appeared in the form of knowledge to remove the ignorance. This knowledge was shared to the world by Sage Vishwamitra. Gayatri Jayanti day is observed by making special prayers and pujas to Gayatri Mata. Special satsangs are also held on the day. Goddess Gayatri is invoked in three forms as Ved Mata, Dev Mata and Vishwa Mata. Goddess Gayatri worship is more of a community affair. Groups of people who are worshippers of Goddess Gayatri gather in a place and offer prayers and pujas under the leadership of a Guru or an elderly person. Chanting of Gayatri mantra is also held on the day.